Known as one of the oldest and richest civilization to have ever existed on planet earth, the now popular artifacts of the Egyptian civilization has so far stood the test of time. From the sky-scraping pyramid to the monumental Sphinx that sits guard to the tombs of pharaohs, we usually tend to forget another subtle but important part the then epitome civilization that lives also exist today along with the pyramid and the sphinx – the ancient Egyptian paintings. Along with the precious handicraft that is left from the ancient era, these ancient paintings represent the essence of the bygone age of Egyptian history. 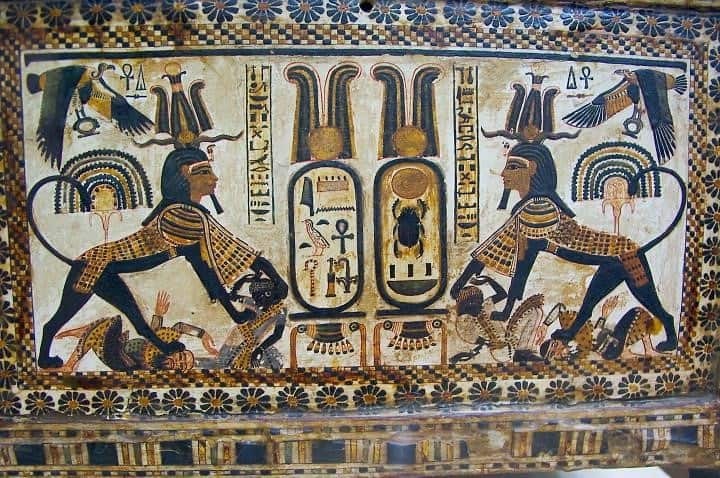 Here are the lists of top 10 ancient Egyptian paintings that still fascinates the visitors alike reflecting the essence of a civilization that used to live a few thousand years ago. Dancing played a major role in the culture of ancient Egyptians. Music and dance were the norm in the civilization. A rhythmic dance was imprinted into the hearts of people, with workers working in a certain motion to the sounds of songs and percussions. 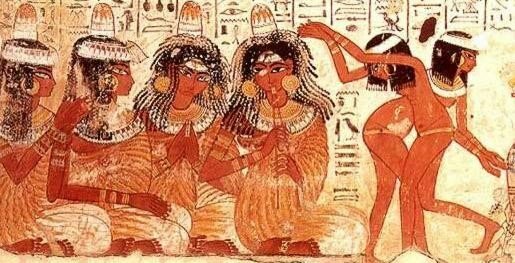 The Egyptian era also saw the start of street dancers way back a few thousand years where they would entertain the passers by. The Egyptian dance was divided into different categories depending on the participants and occasion of dance. This painting, in particular, represents the pair dancing where two women are dancing together in a pair and another group is orchestrating the music. Pair dancing involved either two men or two women dancing together in unison. Similarly, there also were group dances where a group of trained performers would entertain the viewers. But even more popular were the festival dances, each dance for a festival is unique. Mummification was an important part of the entire concept of an afterlife. 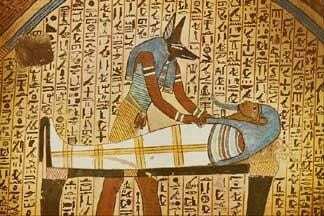 A proper ritual had to be followed to mummify a dead person to ensure his or her resurrection in the future given they win the judgment for another life from the Egyptian gods. Before the old kingdom – the earliest of the Egyptian civilization, bodies buried in the deserts were naturally preserved by desiccation. But as time passed by, the wealthier Egyptians started to arrange for more elaborate artificial mummification. By the period of New kingdom in the ancient Egyptian era, people had already perfected the art of mummification – the best of the techniques took almost 70 days and involved internal organs, the brain and desiccation of the body in a mixture of salts called natron. In the old kingdom, the Jackal-headed god Anubis would look after the burials of the kings. But he soon got replaced by Osiris somewhere during the middle kingdom. The ancient Egyptian societies had a complex system of polytheistic beliefs – meaning the Egyptians believed in and worshipped multiple gods, more often than not the being assembled in a pantheon along with their religions and rituals. The entire civilization was rich with diverse religions, each of them with their own deities, rituals and beliefs – and a staunch number of followers. It was told that different cities had different gods for them, and the followers worshiped their individual deities with a devoted fandom. The most popular of the gods were the Sun god Ra, Anubis the god of death and embalming, Horus the god of sky. 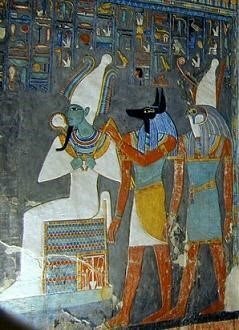 Osiris, Anubis and Horus were in a succession in the above ancient pantheon of Egyptian gods. The Egyptians used to make the most elaborate and beautiful of the tombs for their pharaohs. Infact, ancient Egypt boasted the most remarkable of the memorial tombs, most of which still survive today – the pyramids. There are a number of famous pyramid tombs, noticeably the three massive tombs of the fourth dynasty. But even more spectacular are the paintings engraved inside the tombs, often depicting the journey of the deceased into the afterlife. 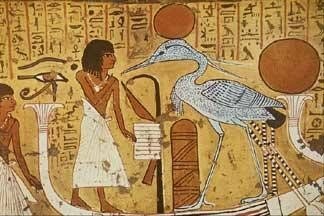 This particular painting in the tomb of Irinefer depicts the deceased standing in the barge of the sun worshiping phoenix, symbol of sun god of Heliopolis. The tombs usually have a number of paintings, reflecting the lives of the deceased. The royal tombs are even more vividly carved with paintings and cartouches – reflecting their journey before their death and then into the afterlife. 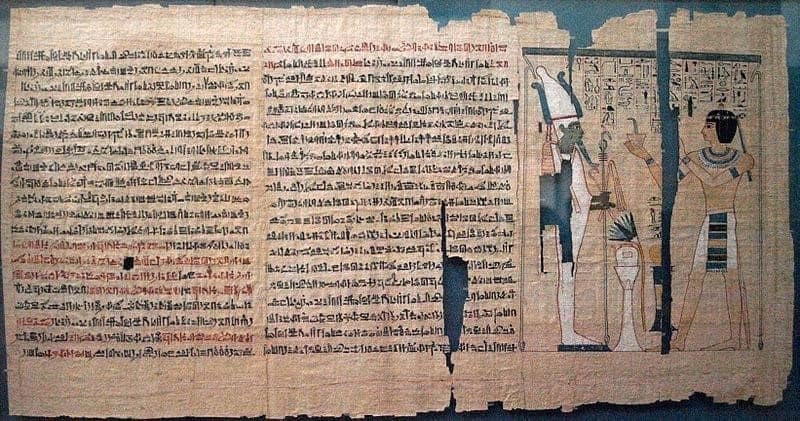 For those who have seen the popular pop culture movies based on ancient Egypt – The Mummy, the book of death is an ancient script that has texts on how to bring back the dead to the afterlife. Is it truly so? The answer would be yes, and a no! The original name for the text is transliterated as “rw nw prt m hrw” which in plain English means “The book of coming forth by day” and also “The book of emerging forth into the light”. This book consists of a number of magical spells that are supposedly used to assist a dead person’s journey through the underworld once they die, and then resurrect into the afterlife. The earliest of the spells were taken more the oldest of the manuscripts dating back to 3000 BC, and the newer spells were added later in the Egyptian history, recent ones written around 11 to 7 century BC. The religion that the ancient Egypt was based on had a firm belief on the concept of afterlife. Rather than a complete cessation, death was taken as a temporary interruption of life. They strongly believed that an eternal life was possible by the means of piety of god and a medium for preserving the dead – mummification. It was told that the prospect of an afterlife for an individual would be decided by the Egyptian deities, as clearly depicted in the above painting. The pharaohs were even staunch believer of the idea of afterlife, and for that reason used to make grand preparations for their funeral, making sure all the arrangements were made such that they would have all essentials available when they were resurrected. At a time when the concept of afterlife culturally influenced the religions and rituals of Egyptian people. The practice of funerary had a higher place in the entire Egyptian civilization. When a person died, it was at the funerary where the deities would decide whether the dead gets a chances of resurrection in the afterlife or not. Arriving at one’s afterlife ordeal was a demanding task, requiring a sin-free heart, ability to recite spells and passwords from the book of dead. 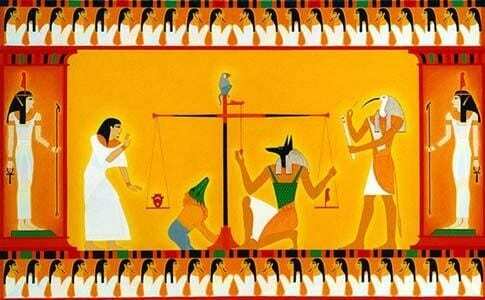 As clearly depicted in the above painting, the heart of the deceased would be weighed against the Shu’s feather of truth and justice taken from the headdress of goddess Ma’at. If the heart was lighter than the feather, they could pass on, but if it were heavier they would be devoured by the demon Ammut. This scene depicts what occurs after a person has died, according to the ancient Egyptians. Egyptian pharaoh Tutankhamun is probably one of the most well documented and heard of amongst the modern people. Ever since the discovery of his nearly intact tomb in 1922, Tutankhamun, popularly referred to as king Tut, has been receiving an unprecedented media coverage and frequent appearances in the pop culture. The cartouche of King Tut shown above depicts the moment of his birth among other events. In Egyptian hieroglyphics, a cartouche is an oval with a horizontal line at one end, that would indicate that the text within is a royal name. King Tut’s cartouche show his birth and throne name. The two cartouches were between rampant Sekhmet lioness warriors depicted as crushing several ethnic enemies while Nekhbet flies overhead protectively. King Ramesses went into numerous war in his regime, and what mattered most was the fact that he emerged victorious in most of them – thus expanding the riches of the vast Egyptian Empire in his 66 year rule from 1279 BC to 1213 BC. He is often regarded as the most celebrated and most powerful pharaoh in the entire Egyptian Empire. His battle against the Nubians, a rich colony of two years hundred years by then, stands well documented in the form of above papyrus painting. It depicts the battle on the south wall of Beit el-wali temple – a Nubian stronghold. Ramesses II was depicted charging into battle against the Nubians in a war chariot, while his two young sons Amun-her-khepsef and Khaemwaset are shown being present behind him, also in war chariots. On one of the walls of Ramesses’s temples it says that in one of the battles with the Nubians he had to fight the whole battle alone without any help from his soldiers. Ramesses was one of the greatest pharaohs to have ever ruled in the ancient Egypt. In a reign of more than 66 years, he led a number of military expeditions expanding the-then Egyptian territory and gaining a stronghold over an impressively large land from the nile delta to the scorching deserts. A rule full of major historic events saw Ramesses well documented throughout his campaign – there are numerous statues, paintings and other artefacts of him from that era. This painting found in one of the pharaoh tombs is the reminiscent of the Egyptian king’s raid against the resurgent Hittite forces of Muwatalli, the entire battle being fought at the present day syria. Against a substantial and far more stronger enemy – Ramesses forces were outnumbered and caught in an ambush, but the pharaoh somehow fought the battle to a stalemate and returned home as a hero. An art that is almost 5000 years old, the ancient Egyptian civilization gave shape to an extremely symbolic and fascinating era of paintings and sculptures that mesmerize people to this day. Even more notable is the fact that most elements of Egyptians art remained remarkably intact and stable over the period of 3000 years that saw no significant outside influence on the-then Nile valley civilization. From some of the most beautiful depictions of ancient wars, to the significantly symbolic representation of ancient religions, rituals and deities, the art of ancient Egyptian paintings have stood the test of time and survived to this age – giving the reminiscence of a bygone era. Even more notable is the fact that most elements of Egyptians art remained remarkably intact and stable over the period of 3000 years or even thousands more that saw no significant outside influence on the-then Nile valley civilization.